Flexseal Large Diameter Standard Couplings are manufactured to order to suit any outside pipe diameter including sewerage, drainage and low-pressure applications. 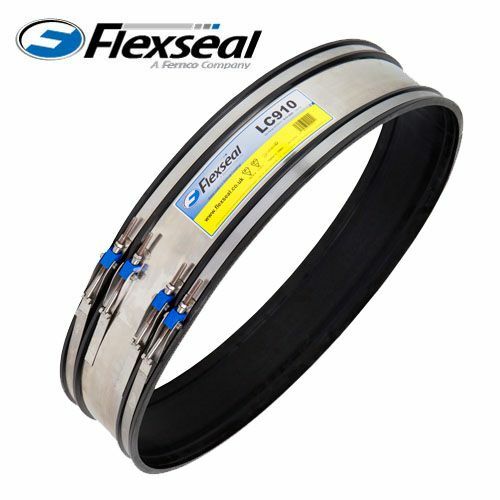 Flexseal are proud to say that we can manufacture the biggest flexible couplings in the world. Flexseal can provide large diameter standard couplings that are manufactured to meet the specific contractor and site requirements. Large diameter standard couplings can be supplied to suit any outside pipe diameter and any size couplings can be delivered direct to the site using the next day delivery service. Flexseal can also supply large diameter standard couplings with nitrile sleeves.